Bond, here is a copy of my official report I submitted to Langley. I left you and Largo's "niece" back at the island so I assumed you're a bit busy and might appreciate using my report for your old man at MI6. CIA, MI6 Interpol, please find my updates to the nearly accomplished 2011 mission “Villains & Voodoo” cruise to the James Bond film sites of New Orleans, Key West and Nassau. You will recall the cruise was redirected to Cozumel due to the arrival of Hurricane Irene. Our combined international team of agents agreed to return this year and finish the remaining activities in Nassau, Bahamas. Black Op members,Rich and Leslie Skillman of Theme Party People organized the weekend event, “Operation Nassau Reloaded" and most all the original team from countries around the world rejoined the mission. Agents arrived on May 24th, 2012 and were greeted 007 lifestyle-wise (you'll probably delete that, eh James?) with Vesper martinis at the British Colonial Hilton, the host hotel and movie site from “Never Say Never Again” (*factoid, the Colonial is also mentioned in Fleming’s short story, “Quantum of Solace”). The ski up scene featuring Fatima Blush was shot on a now long gone tiki bar at the end of the hotel pier. A late evening of Bahamian cuisine and catching up on the year's activities was completed, the group dined at BLU, a few blocks from Rawson Square, site of both “Thunderball” and “NSNA” sequences featuring Bond, Pinder & Paula meeting at the strawmarket and from NSNA, Bond and Small Fawcett connecting. Following an excellent meal which included local conch favorites, chowder and salad, the tour danced to the local band at BLU and returned to the Hilton, ready to begin the adventures in the morning. An early morning departure on the 007 tour bus and Richard narrated the origins of the “Thunderball” production as the group arrived and disembarked at Rock Point, a private residence, more familiar as Largo’s estate, Palmyra. The grounds have seen heavy impacts of hurricane damage since the film’s production in 1965. Of note, the red/white canopies are long gone and one notices the pool has now several statues at each end. Walking around the house, the shark pool is still intact although not in use and in need of much repair. The group mused how incredible this location could serve as a 007 museum or Bed & Breakfast, we could take up a collection but are fairly sure it will fall far short. The bus continued westward and past the Caves, which has been rumored to be the location of Bond arriving ashore from his surveillance of the Disco Volante. This is still being researched. Continuing on, Cable Beach is now under major redevelopment as a new mega resort, slated to rival the Atlantis and is in the process of construction. Christened Baha Mar and funded by the Chinese government, the Mar has leveled many of the hotels once on the premises, including the Nassau Beach hotel, which was featured in NSNA as the hotel Bond & Valerie Leon arrive following fishing and where Fatima blows up the hotelroom. The pool was also featured in the film “Help”. Further west is Love Beach, again not recognizable, which were the beach scenes of Bond, Domino and Vargas, getting the “point”. Richard and Leslie had a surprise for the tour group as the bus arrived at Coral Harbor, where the Royal Bahamian Defense grounds stand. 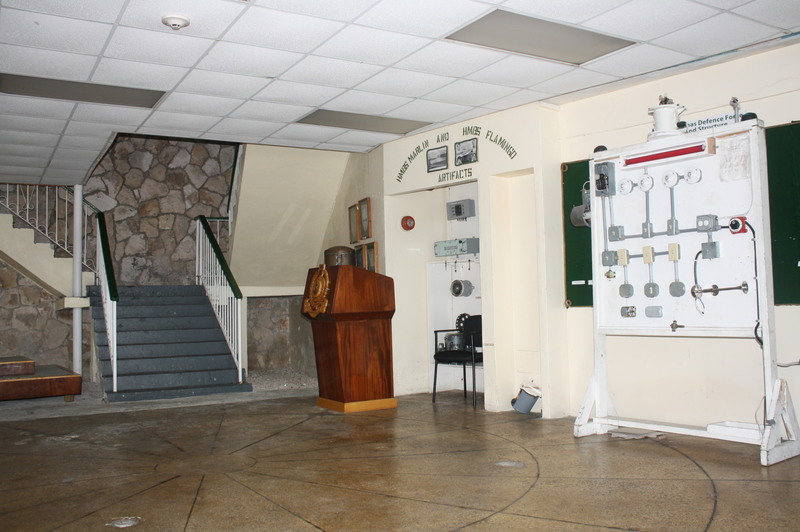 Bond fans that have traveled to Nassau are aware that this heavily guarded military installation contains two of the great Bond sites. Fortunate to have secured permission from the Bahamian government, the bus is allowed to enter and agents disembark. Inside the wired fences stands the Coral Harbor hotel, a site used from multiple Bond films. Immediately entering the grounds one sees the long abandoned construction expansion of the hotel which was used in “Casino Royale”. Largely unchanged, one can imagine Daniel Craig and Sebastian Foucan free running across the girders overhead. Following significant photos and discussion on the action from the film, the group is led to the memorial to the Flamingo, which was sunk in 1980 by Cuba aircraft, killing several Bahamian military. Further walking the grounds, the entrance to the Coral Harbor hotel is relatively unchanged from “Thunderball”, serving as 007’s hotel and where Fiona Volpe drops Bond off after taking “him for a rhy-de”. The interior, although having alterations,can be imagined as the hotel lobby, although keen eye agents remark the sequence is reversed photographically in the film. A walk around to the rear of the hotel yields another film location from Thunderball, the pool area where Bond and Domino walk up from the beach of their first meeting and enjoy a conch chowder pool side. The rocky point where Domino points out to the Disco Volante is easily recognized. We learn of the Navy’s efforts in reducing smuggling in the Bahamian waters and are treated to a stop at the PX, where the agents are free to purchase T Shirts, a rare collectable indeed. From Coral Harbor, we returned eastward and travel down Bay Street, along the same path as the Junkanoo from TBall and over the Paradise Island Bridge and to our next stop, Atlantis. From our relatively staid, British Colonial, the Atlantis property is a din of pools, aquariums, children, bigger children, people from all over… we take the long beach walk with our host GM of the Atlantis, who is very kind to take us onto the breakwater, where Bond fans all know as the launching point of Largos divers. Although now surrounded by luxury, the site remains intact and challenging...a great stop. Staying on Paradise Island, the tour group is welcomed into the One and Only Club and is guided through the “Casino Royale” film locations in the main lobby and as another surprise, into Bougainvillea, the suite occupied by Bond and Solange. The suite is outstanding luxury, with a private pool, three bedrooms…all for a modest $10,000 a night. A walk through the Versailles Gardens and down to Dune by the Oceanside, where the tour is treated to the O & O’s James Bond martini in a private room, overlooking the rocky craig where the Disco Volante crashes and explodes…a fantastic setting indeed. Following the One & Only, we headed to the Buena Vista Hotel which stood in for the Nambutu Embassy in Casino Royale. While there, we witnessed the beginning of its renovation as the new site of John Watlings Distillery (http://www.johnwatlings.com). As a film location it may no longer resemble Bond's encounter with Embassy guards but 007 should take solace in sampling some of the "Spirit of the Bahamas" on his next run through Nassau. Once back at Rawson Square, the Churchill building is very recognizable for its pillars which Nigel Small Fawcett hid behind in Never Say Never Again. An interesting look a the intersection Bay Street and East St, you will see the Chase Manhattan Bank which was remarked to be the area where Bond, held prisoner in the station wagon, sets fire to the villains and staggers off into the Junkanoo.The afternoon is free for the tour, as many continue exploring Bay Street shops, the Straw market and wharf side restaurants. In the evening, the agents were feted to a Vesper cocktail party, with many coming dressed to represent Bond characters over the 50 years of the series. Following this lavish event, seemingly funded by British coffers again (James, you have quite an expense account), the agents returned to Bay Street for customary carousing in the nightclubs. Fortunately, there was not one of those crazy Service Service agents among them. I'll explain it to you later, Bond. A Bond Nassau trip is incomplete without a half day Stuart Cove experience and Nassau Reloaded was no exception. Chartering a private dive boat, Theme Party People led the team to dive and snorkel on several renowned Bond sites off the western tip of the island. The first dive was down to the Vulcan bomber remains and the Never Say Never Again trawler, called for some reason The Tears of Allah, not done so in the film. The dive is incredibly clear and although the Vulcan is barely recognizable, the trawler is in good diving condition. Our second dive was off Goulding Cay, a beautiful reef used in “For Your Eyes Only” as the reef hauling sequence. Our Dive master Kat, brings a container of fish food to the bottom and in a few short minutes, we are all surrounded by an array of brightly colored fish- an incredibly beautiful dive.The next location was for snorkelers only and a bit of high drama, as we experienced a large grouping of reef sharks below us as they tore into a food bucket—the group was both scared and amazed at the size of the sharks not that distant from their flippers. Our return from the reef was highlighted by a close to shore stop at the Albany House, “Casino Royale”s location for the lovely Solange’s horse ride up the beach, Daniel Craig emerging from the surf in very small blue swim trunks and evil Dimitris looking on from his villa balcony. We cranked up the CR soundtrack on the boats sound system and broke out a champagne toast to celebrate our day. Largo passed out SPECTRE certificates authenticating the agent’s dives. Vargas was very happy. The adventures in Nassau continued with cigars and dinner at the Greycliff Restaurant, with tables nearby Michael Douglas and Alice Cooper, resting from their charity golf tournament at the Ocean Club.A late night final return to the Bullion Bar at the British Colonial where exhausted and spent, we gathered for the last time, the last team Vesper and remarked...”James Bond…and Theme Party People tours…will return". This is Felix Leiter, signing off.